One of the most fun plants I've ever had in my garden is at its best this time of year. Syneilesis, or Shredded Umbrella Plant, is an odd but beguiling shade garden resident. The one I show here, Syneilesis x hybrida, is likely a cross between S. aconitifolium and S. palmata. 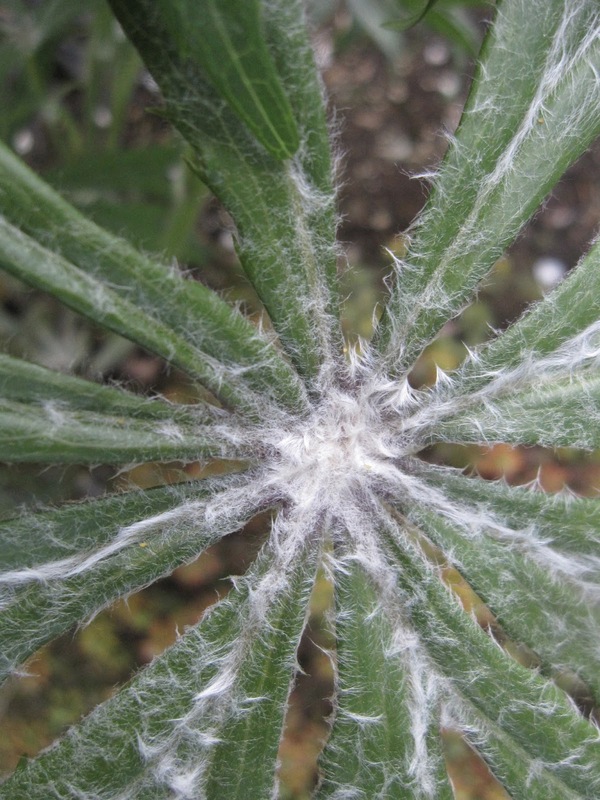 When the leaves first emerge from the ground in mid- to late March, they are strange, silver and furry. My first and largest clump came from Collector's Nursery at the 2010 Lan Su spring plant sale. 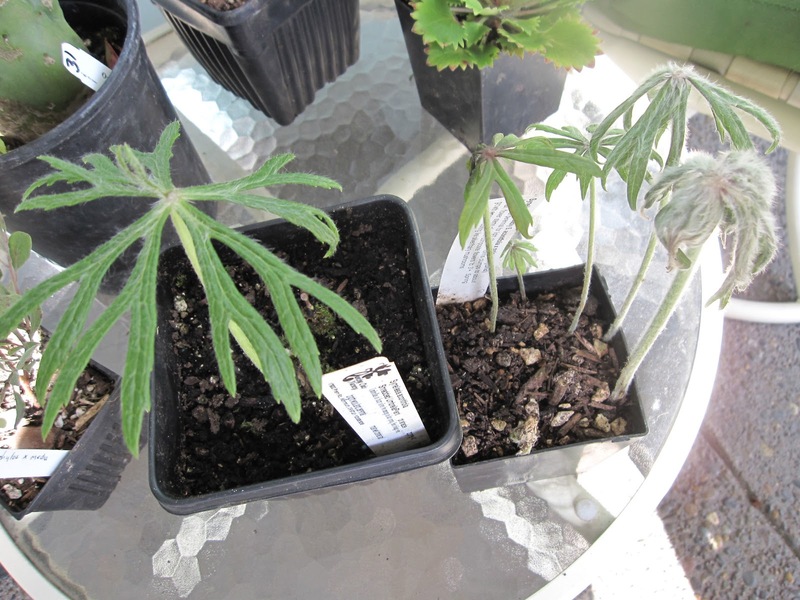 At the 2012 Lan Su spring sale, I subsequently bought another Syneilesis x hybrida from Collector's Nursery, and S. palmatum from Dancing Oaks. When I put them next to my older plant last spring, I thought I could detect a little difference in the plants. S. palmata is on the left and seemed slightly smoother. Looking at pictures of mature plants, the smoothness is more apparent. I planted them all in the same bed, but I think the new ones got too much shade from the Acanthus mollis all summer. They both kind of disappeared - probably helped along by slugs. But this spring, one of them (I don't know which, but I think it may be the hybrid) is making a comeback, though you can see it's still duking it out with the slugs. I love the way each leaf retains a bit of fuzz in its center, even when it's fully open. 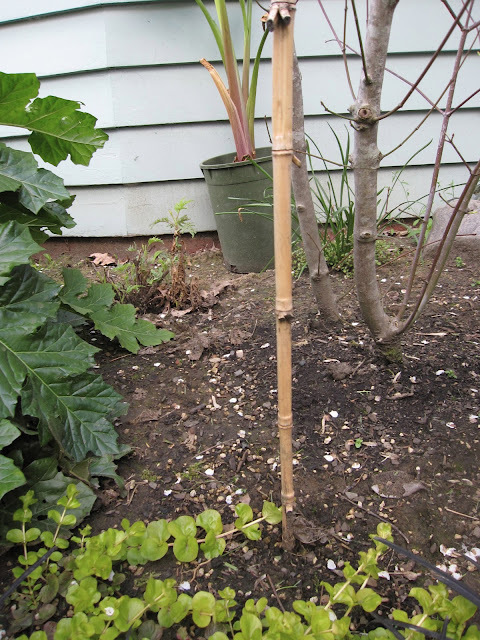 Last year, I had one bloom stalk, but it got broken off before opening, probably by a marauding raccoon. This year, I see at least two bloom stalks on my older plant. 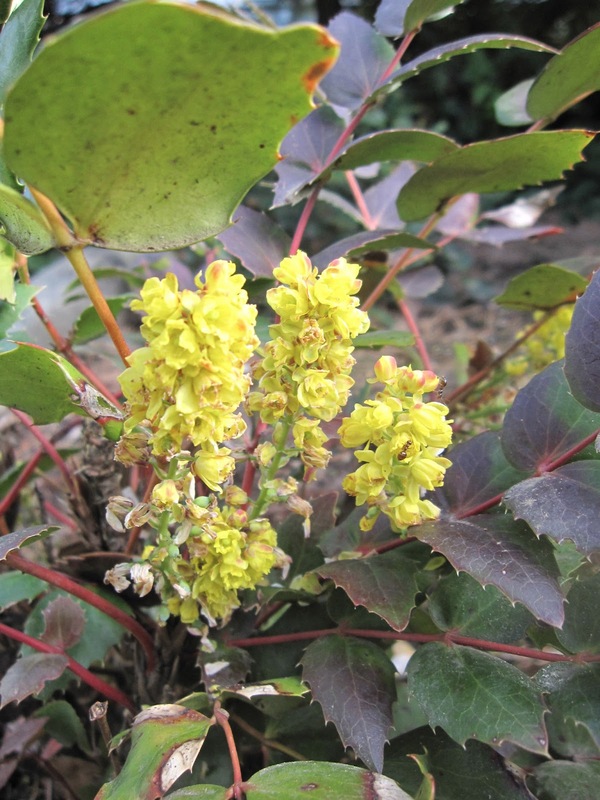 As you might imagine with such an unusual woodland plant, the flowers are apparently something of an afterthought. Still, I'll be interested to see what they look like. You can get this cool Syneilesis hybrid from several regional nurseries including Cistus, Collector's Nursery, and Far Reaches Farm. If you want to know more about this and other Syneilesis species, go here. Foliage Follow-Up is hosted monthly by Pam at Digging. Click over to see what else is happening in the wonderful world of foliage this month. There's something amazing about April, as garden changes happen literally overnight. One day, you're looking at fresh foliage. 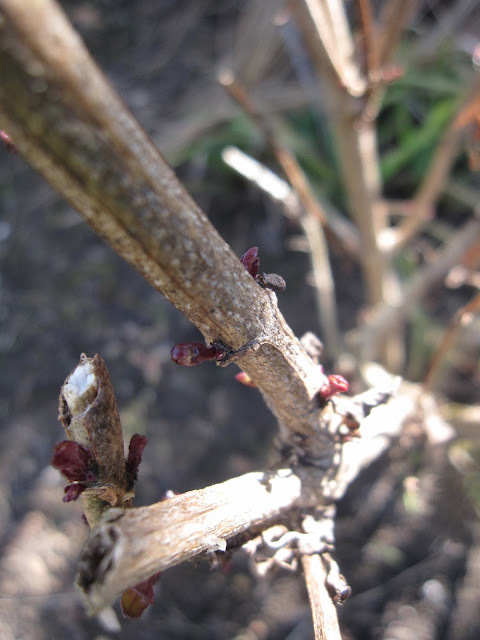 The next day, there's a bright bloom there, and you might not even have noticed the bud forming. 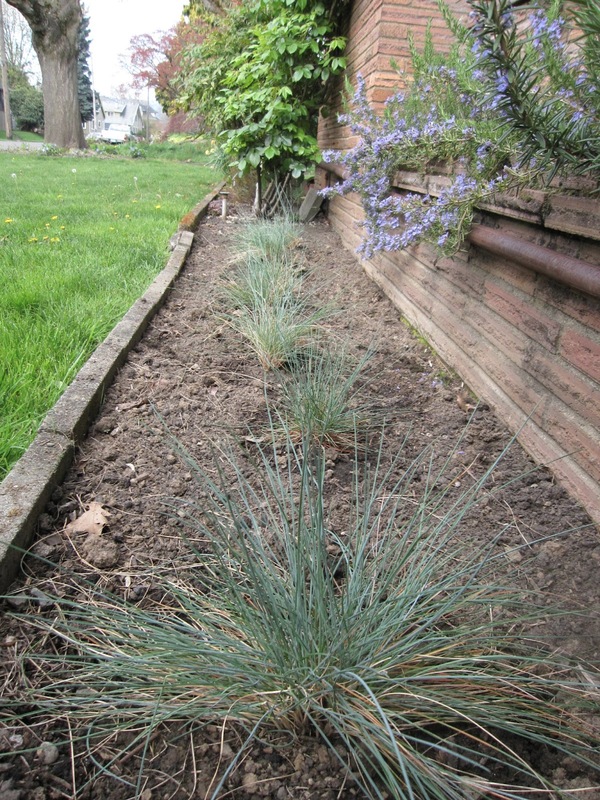 Case in point: I was mulching the front hot bed with rocks this past Saturday. Of course, I had to lift and handle all the plants in that bed to tuck the rock mulch under them. I did notice Helianthemum 'Henfield Brilliant' was looking healthy and happy. Today, out photographing for Bloom Day, a bright orange bloom! It's a tiny showstopper in the middle of the current gray-green landscape of drought-tolerant plants. Another "instant" flower on its way is on a Syneilesis hybrid. Last week they were still just fuzzy shredded umbrellas. 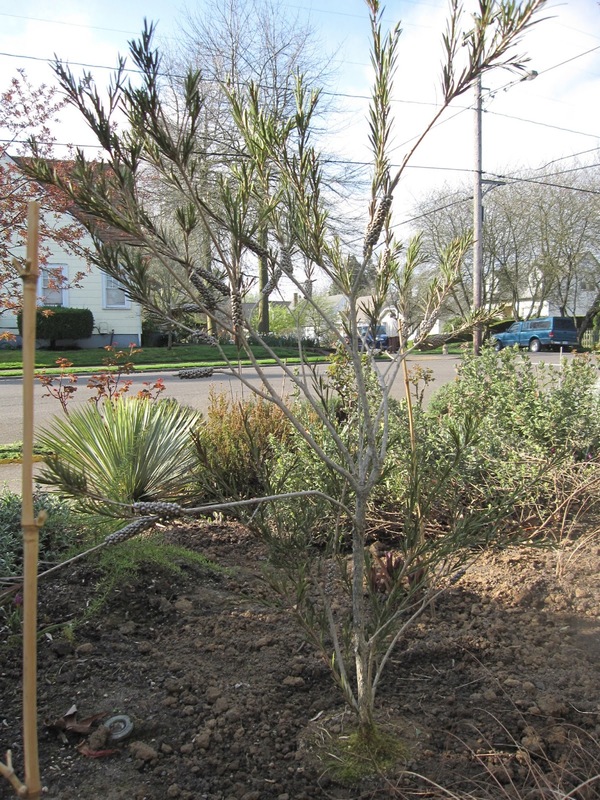 All the Manzanita family are sporting their delicate, urn-shaped blossoms. 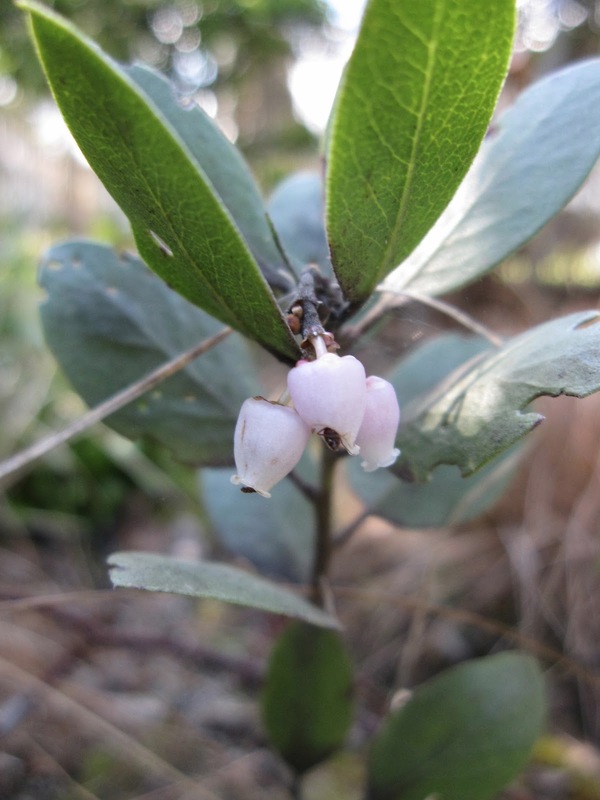 Below, kinnik kinnik (Arctostaphylos uva ursi). Arctostaphylos hookeri 'Green on Black'. Arctostaphylos x 'Austin Griffiths'. It bloomed profusely last month; now there's just one small bloom cluster left. And the blooms on Cornus x 'Eddies White Wonder' get bigger by the day. Loropetalum chinense 'Sizzling Pink' is covered with fluttering blossoms. Blooming on from last month, and proudly representing the essence of pink, is Camellia x 'April Kiss'. I didn't know that Luzula nivea had these cool flower heads. I enjoy seeing Oxalis oregana before the hostas mostly cover it in summer. Stop! 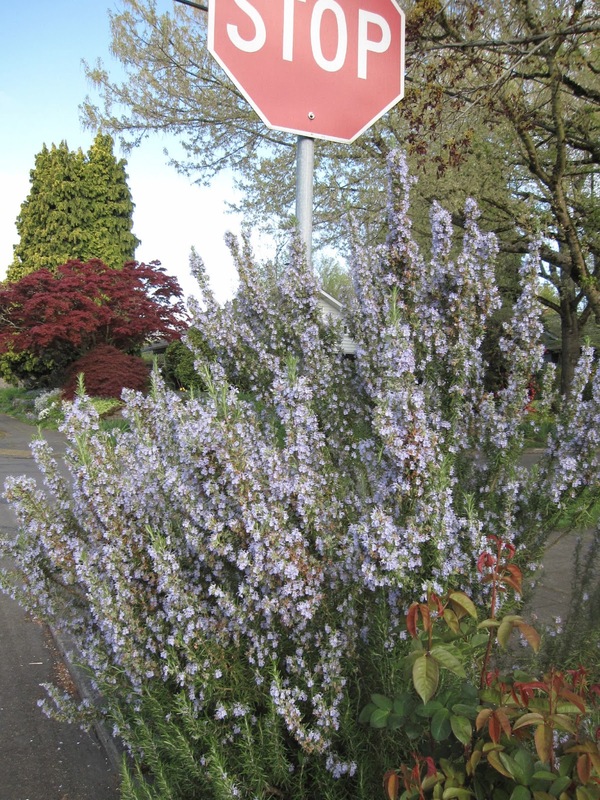 In the name of ... a huge blooming rosemary. 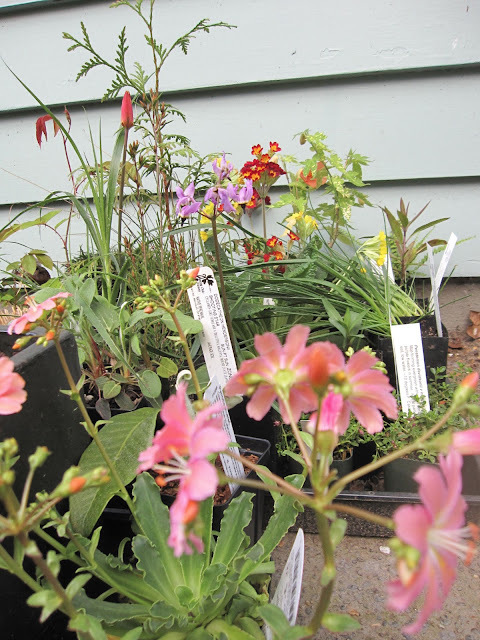 Lastly, a colorful collection of blooms just acquired yesterday at Hortlandia, the Hardy Plant Society spring sale. I hope some of them will feature in next year's April Bloom Day post. Bloom Day is graciously sponsored each month by Carol, of May Dreams Gardens. Click over to see more April 15th riches. Happy Bloom Day! I just looked at the calendar and realized April 3rd is the anniversary of the day, four years ago, that I started this blog. Crazy! I had goals for my blog in that first short post: "I hope it'll be a locus for evaluating my progress in three areas: First, my attempts to teach myself to write. Second, my desire to take better pictures. And finally, my ongoing efforts to create a beautiful and verdant garden here at Longview Ranch." In that four year stretch of time, two very different, but interrelated, results have come to pass. 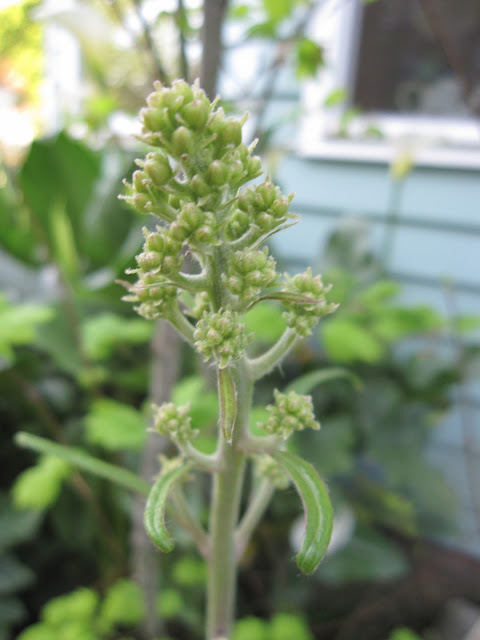 First, as I had hoped, I have watched my garden slowly develop, discovered and incorporated wonderful new plants, spent countless hours enjoying those plants, and in fulfilling one of my goals, I've chronicled the progress of my five-year-old garden. As to the better photography and writing - not so much progress. But, I am having fun, which leads me to the second thing that's happened. I've met an amazing and wonderful group of new friends in the garden blogging community. Some of these acquaintances are virtual, but many of the locals have become actual friends and delightful resources in my quest for garden know-how and plant lore - people I love connecting with at garden events, running into at the occasional nursery, and engaging with in plant exchanges and our own open gardens for each other. What an unexpected and sweet bonus from my garden blog! Now let me show you a little of what these years have brought to the gardens at Longview Ranch as I celebrate four years of blogging. 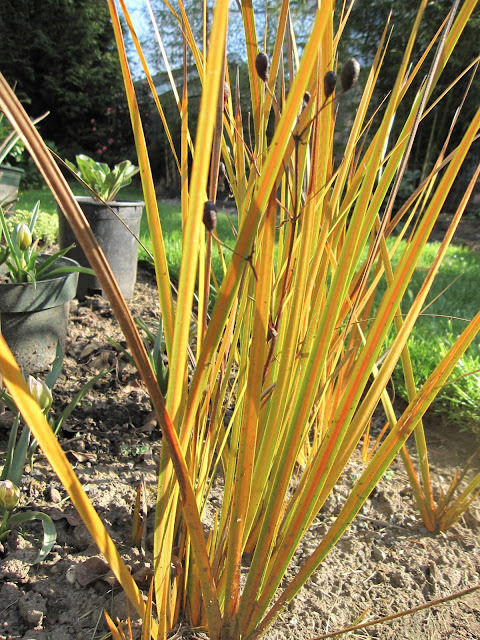 Bright spring sunlight through Libertia peregrinans 'Bronze Sword'. The stunning pink perfection of Camellia 'April Kiss' in bloom. 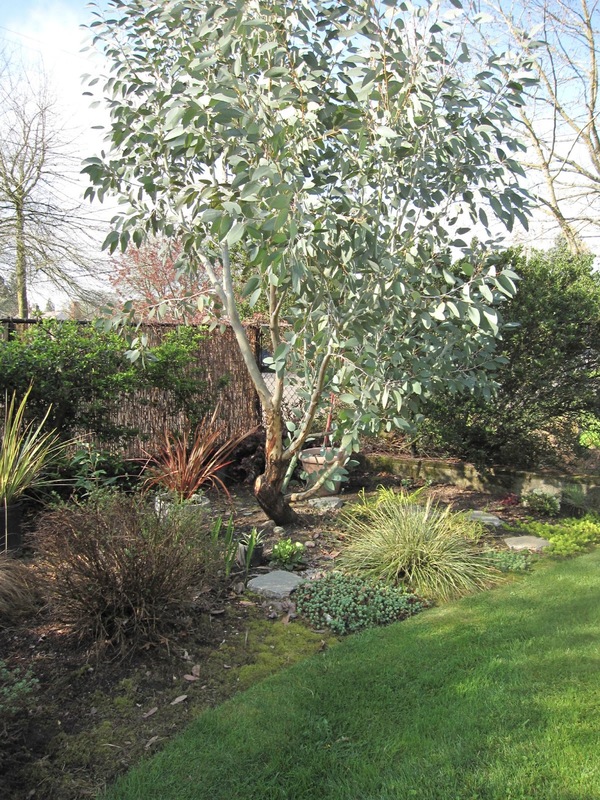 One of my favorite plants in the garden, Eucalyptus pauciflora reigns over the south back garden. A new Callistemon 'Woodlander's Hardy Red', backed by Yucca rostrata and a Cistus. Vaccinium ovatum, Sagina subulata, and Cammasia quamash in the Northwest Territory. Will this be the year the camas blooms? Langerstroemia 'Natchez' (center), a young Trachycarpus fortuneii (upper right), Fargesia robusta 'Campbell Form' (along fence), Kniphofia 'Timothy' (lower right), with Ilex crenata still striving to make a low hedge at the bottom of the image. This year's candles on the shore pines. Just when I think that this winter it really did die, Phygelius 'Passionate' reassures me with a few tiny red leaf buds. A new grouping of Iris x pacifica 'Meadow Pastels' with Mahonia nervosa in bloom behind them. These newly-planted Festuca glauca are seedlings from the parents that already lived out their short lives at Longview Ranch. 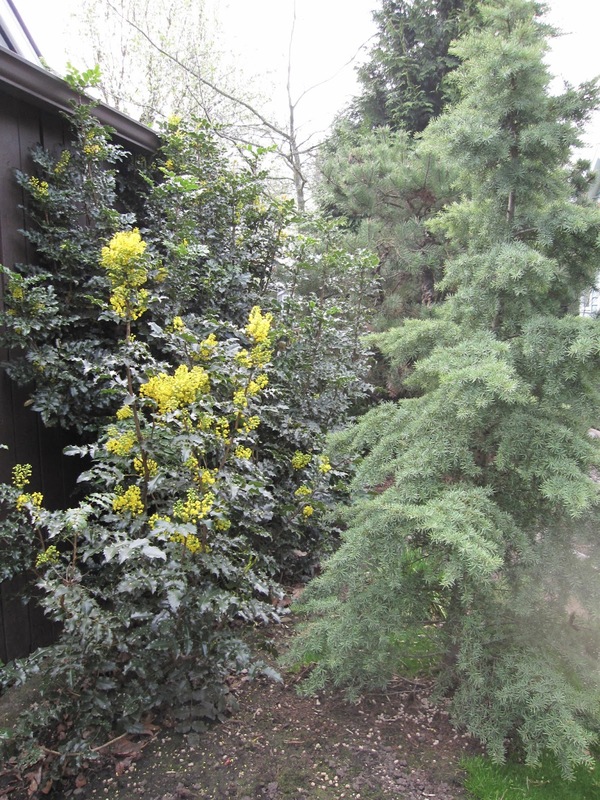 A sweep of plants, including Camellia 'April Kiss' in a shady area. I have come to love gold and chartreuse foliage, especially contrasted with gray, silver or red. Callistemon viridiflorus (center), Trachelospermum jasminoides 'Confederate Cream' (on fence) and Carex buchananii 'Bronze' (lower right). 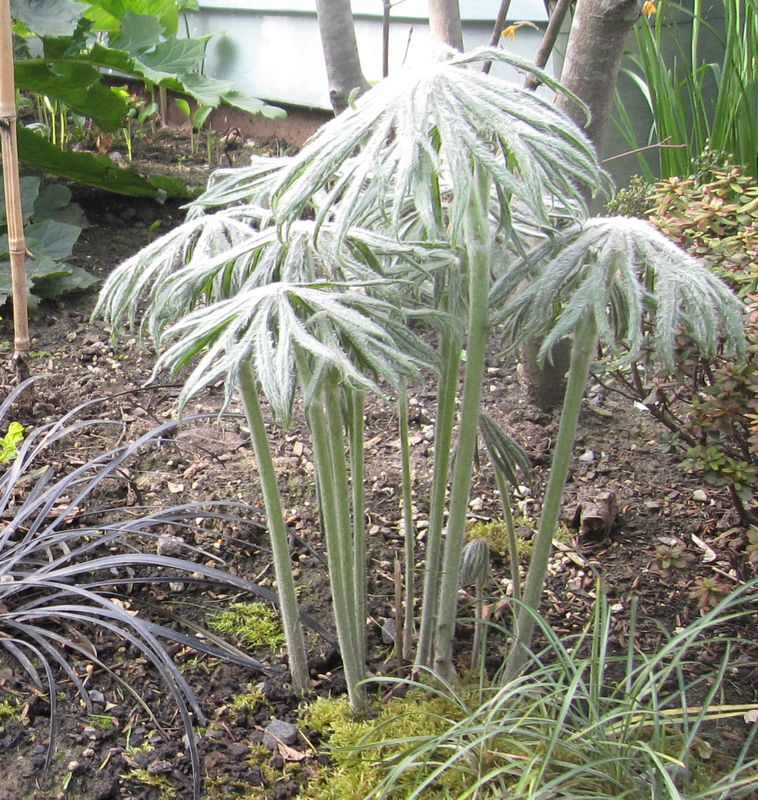 Rhododendron impeditum, a Syneilesis hybrid, Ophiopogon planiscapus 'Nigrescens' and Acanthus mollis. This garden blogging business has been a wonderful four year ride, one which a few of you have been along on almost from the start. I have appreciated every reader, and every comment left for me, from the very beginning up to my most recent post. I'll keep recording my progress in the garden here, and I'll look forward to meeting even more of you - virtually, locally, or even at my first Garden Blogger's Fling in San Francisco this summer. Here's to four more years in the gardens at Longview Ranch!